Oral B Electric Toothbrush Models - Which Is The Best? Home / Best Electric Toothbrush / Oral B Electric Toothbrush Models – Which Is The Best? is the best value for money? This is a question that visitors to this website most often ask. There are many Oral B Electric Toothbrush models like Black and White, PRO and vitality lines, each with unique features that makes them unique from the rest. The most popular one, by far, is the Oral B White Pro 1000 Power Rechargeable Electric Toothbrush – and it isn’t hard to see why after reading this Oral B 1000 Pro review. 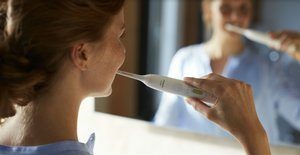 In this report, you’ll learn about the features of each Oral B electric toothbrush and what makes it a good pick (or not) for your specific requirements. For each model of Oral B electric toothbrush, you will first learn about its features and then be able to compare or contrast them against what other models offer. There are some features which sound good on marketing brochures and ads, but add little value in a practical sense to Oral B electric toothbrush users. But other features are critical in making the right choice. After studying this analysis, you will be a lot more confident than earlier about selecting the best Oral B toothbrush for your needs. Which Oral B Electric Toothbrush Models Are Available? For the Oral-B kids electric toothbrush and Oral-B Genius Pro 8000 electric toothbrush models, be sure you read our other review for more details. A word of caution before we begin. Some of the older Oral B electric toothbrush models were named in a confusing manner. Even when they had very similar features, the models might be named differently. So it used to be hard to compare them, or to find a specific brush. All that has changed lately, and the newly organized catalog is a lot more intuitive in naming and categorizing toothbrushes. Where Can You Buy Oral B Electric Toothbrushes? Most online retailers feature the entire range of Oral-B toothbrushes and you can read reviews, compare features and make your purchase from the same page. If you prefer to touch and hold the toothbrush before deciding, you can walk into offline retailers like Target or Bed, Bath & Beyond where popular brands of electrical toothbrushes are on display. The Oral B Vitality FlossAction electric toothbrush is another hot seller, with its 2-minute timer and range of brush heads being attractive features. It is a good toothbrush with simple features and an elegant, slim design. There’s a 360 degree grip that makes it convenient and easy to use. The Vitality Floss Action has an NiMH rechargeable battery that typically lasts 8 days after a complete charge. The brush heads of most Oral B electric toothbrush models are interchangeable, so that you can use others like Cross Action, 3D White, TriZone and Sensitive brush heads with the same handle. A word about the Oral B electric toothbrush head design and efficiency is in order. The bristles are angled so that cleaning is optimal on the surface of teeth as well as in the interstices between them. In addition, the FlossAction brush head not only oscillates and rotates but also delivers micro-pulses that clean deeper between teeth. The Oral-B Pro 1500 is representative of the powerful benefits of an Oral-B electric toothbrush, offering excellent plaque removal and improved dental hygiene within a short time of starting to use it. There is a consistent power delivery which accounts for the significant advantages of using an electric toothbrush instead of a manual brush. The brush stroke is consistent, resulting in a bright smile, white teeth and enhanced dental hygiene. Brushing twice every day ensures better, cleaner teeth and healthier gums. The removal of dental plaque reduces mouth bacteria and keeps you healthy. The Oral-B Pro 1500 CrossAction electric toothbrush offers a range of cleaning modes and is compatible with many different Oral B brush heads. The Cross Action design boasts of angled bristles that are so arranged to lift up and remove plaque along the gum line. It is an Oral B electric toothbrush of choice for teeth whitening and plaque removal. Oral-B Vitality Dual Clean : A popular new addition to the Oral B Vitality electric toothbrush collection, this model has a few outstanding features that make it a great choice. Oral-B Pro 6000 SmartSeries : This electric toothbrush has a slim, more modern design and improved battery life compared to earlier models. There are several options of brush heads, such as CrossAction, Sensitive and 3D White for better cleaning and to meet requirements of those with special needs. The only difference between these 2 models is the color (white or black). Priced around $225, this feature-rich type of Oral-B toothbrush offers 6 distinct modes of operation – Daily Clean, Deep Clean, Whitening, Sensitive, Gum Care and Tongue Cleaning. As I have often said in analysis of brushing modes, this diversity is one of those features that sound better than it really is because most of us will only use our electric toothbrush in one mode. The top brushing action with the Oral B electric toothbrush is a 3D movement which generates over 38,000 pulses per minute. That’s the equivalent of almost 8,700 oscillations every 60 seconds and this ranks top of all other comparable models offered by Oral-B. The tongue cleaning mode is unique to this model. However, cleaning your tongue manually is often more effective. There are 5 types of brush heads included in the package – two Cross Action, one ProWhite, a FlossAction and a Sensitive head. Like other top electric toothbrushes, the Black and White Oral B has an excessive pressure indicator which lets you know when you press too hard against your teeth. A brushing timer and quadrant timer help ensure that you brush your teeth for an adequate duration to achieve cleaning. Extra add-ons are a bluetooth functionality which links your toothbrush to a mobile phone app to record brushing data and to help remotely monitor a child’s brushing habits. Another promise of the Oral-B electric toothbrush is that it is designed with special seals that make it more waterproof than other models. It is impressive that when the toothbrush was tested under 500 millibars of pressure, there were absolutely no leaks. Still, common sense dictates that it is not wise to immerse the entire handle in water. Splashing water on the brush probably won’t cause any harm, but soaking it for a longer time in water might cause some seepage. A premium travel case adds a touch of class to this top-of-the-shelf model of Oral-B electric toothbrush. At $165, the Oral-B Pro 5000 is a high-end electric toothbrush with 5 brushing modes. Like the Black/White 7000 model, however, the most frequently used is the Daily Clean 3D movement with 40,000 pulses per minute. There’s just one CrossAction brush head in the package. You can choose from a wide range of replacement brush heads in the Oral-B catalog when you need to replace this. All brush heads are compatible with the diverse models of electric toothbrushes, rendering this a less important feature when it comes to making a buying decision. Other features like the pressure indicator, timer and quadrant timer are identical with other models. A wireless SmartGuide unit helps link the toothbrush with a smart phone app for remote monitoring and storage of historic data. The remaining models in the Oral-B electric toothbrush range have fewer features. But their prices are also significantly lower than the top of the line models, making them excellent value for money. For instance, the less expensive models may not have a wireless/Bluetooth functionality to synch data with your smart phone app. However, when you think about it, this feature isn’t likely to be of use to everyone. So if you can live without it, the cost savings alone will compensate adequately. If there are fewer brushing modes, it usually isn’t a deal breaker because most users will anyway brush using the Daily Clean mode. So if you choose a Oral-B PRO 3000 for economic reasons, you will not significantly affect the teeth cleaning capacity or any of the core functionality of an electric toothbrush. On the other hand, the Oral-B PRO 1000 has a sharp decline in performance, with its top vibratory capacity being much lower than other models. So this brush is not as good at plaque removal or cleaning as its peers, and I do not recommend it despite the lower price if plaque-removal is important to you. The Vitality line is even more limited, and doesn’t even have the vaunted 3D brushing motion technology that facilitates ‘non-contact brushing’. By choosing either the Vitality Floss Action or Vitality Dual Clean models, you’re not getting a state-of-art Oral-B electric toothbrush. If you study the information brochure on the Oral-B website, you’ll notice that the technical specs mention a battery life of “upto 2 weeks”. Now, this depends upon several factors. If you use one of the simpler modes like Pro White, Floss Action or Sensitive, the battery is likely to last longer between charges. But with the Vitality Dual Clean mode, because of multiple moving parts that place a greater strain on the electrical motor, battery life is typically as short as 5 days, or even less. Hopefully all this information about the Oral-B electric toothbrush models will help you choose the right one for your needs. If you want more specific information about a model, be sure to browse our collection of Oral B toothbrush reviews on the page about electric toothbrush reviews.